National Signing Day is the equivalent of Christmas in February for college football fans all across the country, and for Clemson coaches and fans, Christmas came a little early and filled with many surprises. Clemson head coach Dabo Swinney signed a class of 23- -all of which will take the Tigers one step closer to being the program they strive to be. 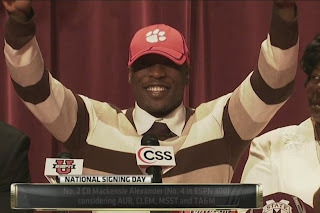 The class was ranked 13th by ESPN and was highlighted by 5-star defensive back Mackensie Alexander and 4-star offensive lineman Tyrone Crowder, and Swinney said that the young men that chose to come to Clemson could have played anywhere in the country. Wiggins, a 3-star defensive back out of Durham (NC) Hillside, was a long-time UNC commit right up until signing, when he announced that he was signing with Clemson. Wiggins took an official visit Clemson in late January, but played his recruitment very close to the vest during the entire process, making his announcement the biggest surprise of 2013. As a senior Wiggins accounted for 90 tackles and seven interceptions. He tallied 80 tackles, 12 pass break ups, and six interceptions during his junior season. The Tigers battled Auburn and Miss. St. for the Alexander’s services, but in the end he made a decision to come to Clemson based on where he felt the most comfortable and where he could have the biggest impact. It’s no secret that the Clemson secondary struggled in 2012, giving up 240.3 yards per game. The 5-star from Immokalee (FL) has all of the physical tools to come in and play at cornerback right away ,especially since the Tigers lost starting corner Xavier Brewer and the position was plagued with injuries last season. The U.S. Army All American had 51 tackles, four interceptions, two caused fumbles, and one recovered fumble. After the early departure of Clemson’s leading receiver Nuk Hopkins, receiver Mike Williams from Santee (SC) Lake Marion will have the opportunity to step in and play in offensive coordinator Chad Morris’ high octane offense right away. Williams was rated the No. 2 player in the state of South Carolina and he believes that he can have the same type of impact Hopkins had as a freshman, filling a critical need for the Tigers at the receiver position. As a senior, Williams caught 60 passes for 1,395 yards and 10 touchdowns. The recruitment of defensive back Ryan Carter was very tumultuous at times because he hails from Loganville (GA) Grayson, the same school as No. 1 recruit Robert Nkemdiche. The Clemson coaching staff waited until signing day to officially offer Carter in order to avoid the speculation that he was only being offered because of Nkemdiche. However, after seeing Carter play in person last season, the Tigers definitely stole a very talented player out of the state of Georgia. Carter is very quick and could help the Tigers in the return game, especially since Clemson struggled mightily in that phase last season. At defensive back, Carter is always around the ball and making plays. He’s also not afraid of contact and isn’t scared to make the big hit. Carter played on offense and defense for Grayson, tallying 70 tackles and two interceptions while hauling in 49 passes for 1,112 yards and 10 touchdowns. National recruiting analyst Tom Lunginbill tabbed Boulware as the identity of what Clemson’s defense strives to be- tough. The 4-star linebacker out of Anderson (SC) T.L. Hanna is the epitome of toughness and physicality. After seeing Boulware play numerous times as a Yellow Jacket, I liken him to the Carolina Panthers’ rookie Luke Kuechly- he simply finds the ball and makes a play. During the Under Armour All-American Game, those that lined up opposite of Boulware knew they needed to buckle their chinstraps before going against Boulware because of his physical play. As a four-year starter, Boulware tallied 592 tackles, 28 tackles for loss, six interceptions, 12 forced fumbles, three recovered fumbles and 10 pass breakups. This post was written by Clemson Girl's Sports Bloggess, Nikki Steele.